After struggling through Part 1, you have the consolation of knowing it's half over. This concludes this 2 part Adventure it requires you completed #10 and received the password to start #11. I am pleased to report, however, that the second part of Savage Island was not as frustrating for me personally as the first. It was tough from the outset, but the puzzles early on made logical sense, and experimentation paid off -- seeing what the game would let me try allowed me to make some progress. Later on, I got stuck in a spot where I wasn't sure I was doing the right thing, and in seeking hintage I discovered a truly diabolical time bomb left ticking by my not-quite-correct completion of the first part! So it was back to Part I to finish the game correctly. Then, very near the end of the game, I got stuck again, several times, failing to even comprehend what my final objectives might be, and resorted to further hint and walkthrough resources. All praise to the Internet, friend to the woebegone Adventurer! All things considered, given the game's intentionally extreme difficulty, I feel like I made it through Part II with some shred of my dignity intact. And I didn't have to rely on any save cheats this time -- I played #11 the old fashioned way, using the TRS-80 Model I, via emulation, for old times' sake. The game provides descriptions and subtle clues where they are important, and I did enjoy this one, despite beating my head against it now and then. I was always able to make a little bit of progress and gain some understanding on my own before feeling like I'd tried everything there was to try, and turning guiltily to the offiical hints and (in dire straits) to an unofficial walkthrough or two. Feel free to pause here and play #11 yourself, but remember that you have to play #10 first, and play it more successfully than I did the first time -- being unable to give the password proves instantly fatal at the start, and giving the not-quite-perfect password proves fatal later on. When you get back to #11, the best advice I can offer you is this -- just relax, and breathe. The opening puzzle is tough but fair -- the solution confounded my expectations of Adams' two-word parser for quite a while as my lungs kept exploding in the vacuum of space. There weren't any items I could productively make use of, and eventually I figured out I could CLOSE EYES and OPEN EYES, which came in handy later but was not of much help with this puzzle. Then EXHALE produced a useful response from the game -- Try "BREATHE OUT" -- and I managed to explore a bit before asphyxiating. I then discovered that BREATHE DEEP was also quite useful, and managed to survive the prologue on my own. I learned to leave the Large plastic block alone -- I thought of it as a bigger relative of an old friend from Part I, but carrying it around kept causing an "EXPLOSION! Time paradox shatters reality" event to occur. I didn't initially understand why it was exploding -- I thought the time paradox was the culprit, and that I had taken the block somewhere it used to be prior to the transition to Part II, causing it to overlap its former self. I erroneously assumed I was somehow moving sideways or backwards in time in Part II, which was way off as it turned out. The block's true nature eluded me for quite some time, despite its being decorated with a picture of an atom flying apart. The Neanderthal proved a difficult but fascinating foe and companion -- I tried luring him into vacuum, but his lungs clearly lasted longer than mine. This actually provided a clue as to the purpose of the PSYCHOTRANSFIGURATION device. I had an idea about how to sedate him from smelling the flower, but needed a hint to learn I could HOLD BREATH, CRUSH FLOWER and put him under without doing the same to myself. I figured out I need to DRAG his sedated body into the proper room to make the brain exchange, as it was the one place he wouldn't follow me on his own. But I could find no Rayshield, as requested by the machine, and finally resorted to a hint to discover I actually needed something that I was missing from the first part of the game. Not the early part of THIS Adventure, mind you, but Adventure #10! There are actually TWO different congratulatory game-ending passwords for Savage Island (Part I), and I had failed to obtain the more useful one. I'm sure someone out there was snickering at my short-lived, presumptuous "triumph" at the end of yesterday's post. Well played, Mr. Adams. Well played! Once I was in Neanderthal mode, I made some progress. Well, a little progress. I mapped out most of the rest of the ship, broke the punching bag, listened to the captain's log wafer way too many times, and looked repeatedly through my belongings in abject bewilderment. I had to consult the hint book again, and ultimately find a walkthrough, to figure out why and how to find and use the thread with the treadmill to pull the lever. TIE THREAD and TIE BANDANNA remained completely ineffective until after I had done the requisite UNRAVEL THREAD. The hint book didn't provide the exact steps or verbiage, so I must bow to more persistent players than I for the walkthrough assist. Unfortunately, pulling the lever just created a more dangerous vacuum beyond the force fields. I found myself trapped in the current section of the map, with no good ideas as to how to proceed. I had to consult the hint book again to discover that the... no. No. Really? TIE THREAD, TO THREAD creates a loop, which forms a portable hole. That's some magic alien Beatles thread right there, folks. I would never have thought to try that on my own, I'm sure, but the portal was a neat concept, fun to play with, and absolutely critical to finishing the game. I remained confused and allowed a walkthrough to take me through the next section. Due to my confusion about the plastic block, I didn't really understand what I was doing with this second-to-last objective -- I had seen the control console display showing dinosaurs rampaging on Earth, and transported myself to the ship in Part I via an earlier blinding flash of light, but didn't realize that putting the large plastic block in the force field room near the first control console and pushing the button after repeating the first game's FREE password would... send an atom bomb planetside and kill all the dinosaurs. I regret doing that, actually, but it was a necessary step to finish the game. As a certified armchair biology geek, I must note that the game's science is a bit off -- the dinosaurs disappeared long before the 100,000-years-ago mark when the game takes place (actually, they didn't disappear at all -- they still have feathers and chirp quite pleasantly nowadays.) The end of the thunder-lizard era is currently calculated at around 65 million years B.C., though the dates keep becoming more precise as dating techniques improve. And I don't think the seed species would have survived very long with the amount of inbreeding the endgame story suggests took place. Plus, the pressure of one's internal organs pushing against outer space vacuum probably can't be overcome by simply exhaling before entering the void without a spacesuit. But this is a game, after all. I didn't raise any quibbles about SAY YOHO. The final objective, more of a surrender, really, was very fun, though hard to discover without a good deal of playing "what haven't I done anything interesting with HERE yet?" I like that Scott's ROBOPIRATE predates ROBOCOP by several years, and might have made for an interestingly whacked-out 80's movie. I had also been picturing more organic antennae on his head as described in Part I, so learning he's a robot rather than an insectoid alien was a neat little twist. Though I must confess, with all the time-travel outer-spacey goings on, I was kind of hoping the game would somehow end in a London flat with a blood-soaked book on the shelf. There's almost enough story in the coded message for a third game, actually. But as it stands, I'm kind of relieved to be bidding farewell to the cruelties of Savage Island. Though I am glad to have experienced it, in a Nietzschean kind of way. Wow. The last Adventure of the canonical twelve stands before us. It's another co-written game, as we embark upon Scott Adams and William Demas' Adventure #12: Golden Voyage! 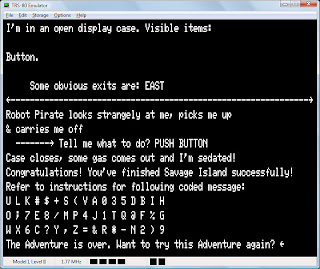 I can remember, back in my TRS-80 days, trying every trick I could think of to get clues for this adventure. I only had the hint book for adventures #1 through 9, and none of my friends had finished Savage Island Part 2. One trick I tried was to break out of the game and look at the ASCII strings still present in memory. Scott Adams' adventures stored all the strings -- object names, place names, and messages -- as what I later learned were called null-terminated strings.